Shopping for Ars Moriendi Pins? "Laissez les bon temps rouler!" Let the good times roll with this Ars Moriendi Good Times Enamel Pin! This 1 1/2-inch tall pin features 2 rubber posts and is made with hard enamel and polished metal. 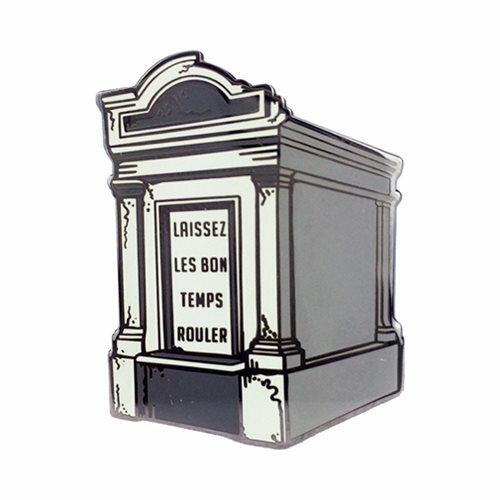 Displayed on a card back, this Ars Moriendi Good Times Enamel Pin is the perfect addition to your pin collection! The Ars Moriendi(the art of dying) are a duo of Latin texts dating from the early 15th century, serving to instruct readers of the day how to die well. Creepy Co. brings the Ars Moriendi line to life for those who find deep meaning in the macabre, delight in the decaying, and sustenance in the strange.